Mexican One Pan Pasta Recipe - Bake.Eat.Repeat. 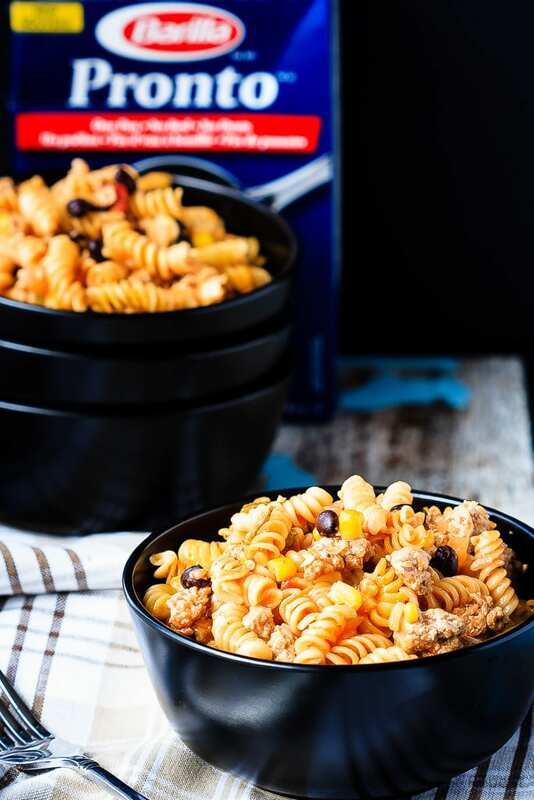 Super fast and easy Mexican one pan pasta – it takes less than 25 minutes to have a flavourful, one pan pasta dish on the table that everyone will love! Two of my favourite things to make/eat for supper are Mexican food and pasta. Easy to make, so many options, and the whole family loves them both. So when I can combine the two into this amazing Mexican one pan pasta? That makes for a whole lot of happy people around here. This Mexican one pan pasta was so good. So good in fact, that all my kids even ate it. And liked it. And it had salsa in it which we all know is way too spicy for children who like all the things as plain as can be. I think that maybe I’ve placed unknown food in front of them so many times now that I’m wearing them down. They don’t even bother to complain anymore, or say they don’t like it before trying it. They just eat it. I think that’s win for the parents. Nice when that happens. Also, my daughter decided she likes black beans after eating this Mexican one pan pasta. That definitely indicates a winner in the meal department. I had stopped even trying to get them to try beans, and just started telling them go ahead and pick them out. Whatever. But she ate them. And liked them! This is exciting stuff! All that to say that your family will like this pasta. It’s fantastic. 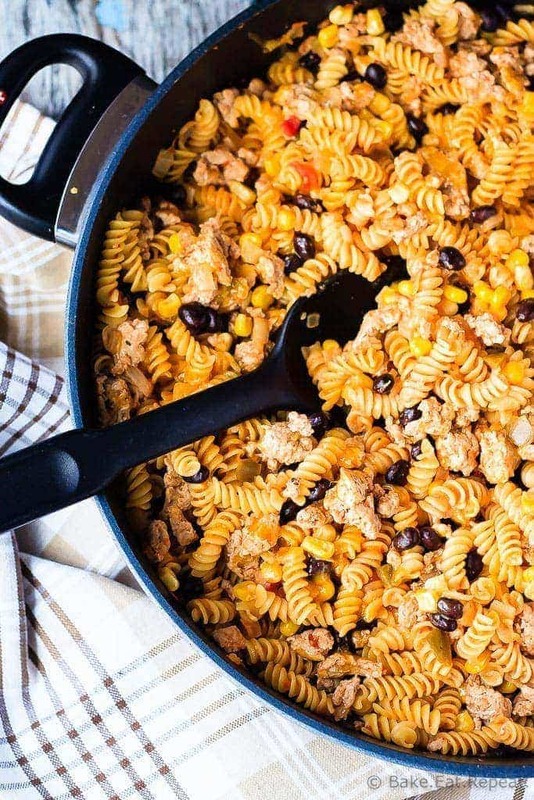 Because anytime you can combine Mexican flavours with a fast and easy one pan pasta that is on the table in under 25 minutes, it’s a great meal. For this Mexican one pan pasta I used a new product line from Barilla called Pronto pasta. This pasta is great for super fast meals as it removes the steps of boiling the water and draining the pasta. Perfectly cooked pasta in 10 minutes. The only reason this Mexican version takes a little longer is because you need to chop an onion, grate some cheese, and brown some ground turkey first. Still pretty quick, and all done in one pan so the clean up is fast too. Definitely a winner. We will be making this one a lot I think! This post has been sponsored by Barilla Canada, and I have been provided with product and compensated for my time. All opinions are, as always, my own. For more information about Barilla’s new Pronto pasta, as well as more recipe ideas, please visit http://www.barilla.ca. 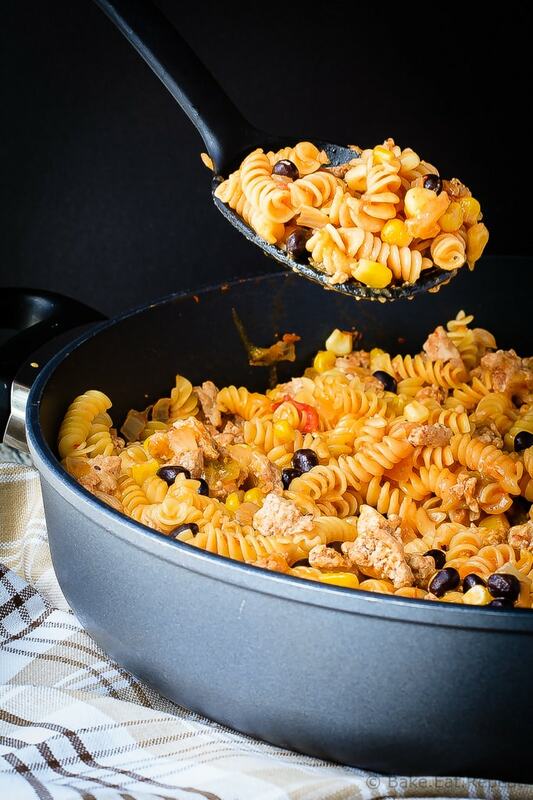 Super fast and easy Mexican one pan pasta - it takes less than 25 minutes to have a flavourful, one pan pasta dish on the table that everyone will love! In a large, non-stick skillet over medium heat, cook the turkey, onion, garlic, salt, pepper and chili powder, stirring until the turkey is browned and no pink remains, about 4-5 minutes. Add the Barilla Pronto rotini, chicken broth and salsa, and stir to combine. Increase the heat to medium high and cook, stirring 2 or 3 times, for 7-8 minutes or until most of the liquid is absorbed. Stir in the corn, black beans, milk and cheddar cheese. Let it cook for another 2 minutes until the cheese is melted, the corn and beans are heated through, and the pasta is tender. Enjoy! Source: Adapted from my Mexican Baked Pasta . mmm one pat pasta meals like this are so good! I love making these when I get home from work! So easy and so good! I am all for a one pan pasta, any night! My kids LOVE pasta too (obviously!) so they always go over well. What a fun way to introduce a little more Mexican flavor to the kiddos! Mexican food and pasta are our main go-tos as well! Love combining the two, looks great! Yay for quick and easy meals! 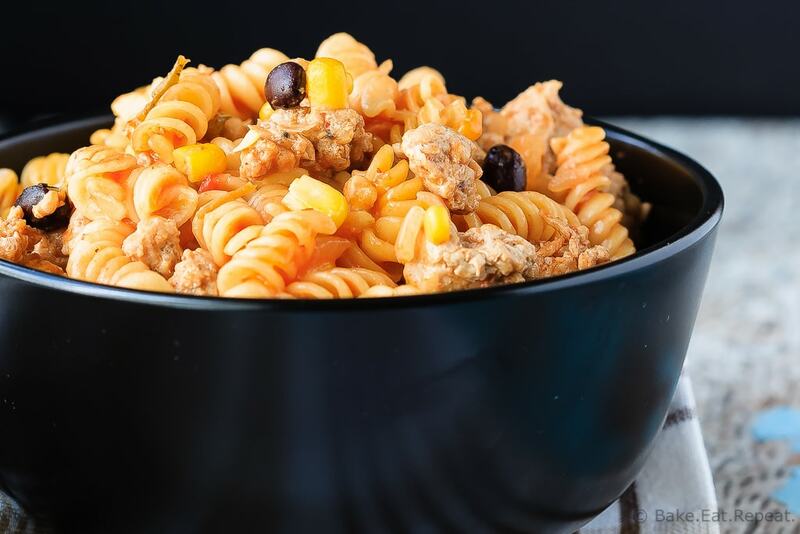 This one is definitely a winner - it looks super delicious and you can't go wrong with Mexican and pasta for dinner! I love using mexican flavors in pasta dishes! They go together surprisingly well! Oooh yum! This pasta meal looks amazing! I'm allllll about pasta and Mexican food too! I love that I can make this in one pan...so much easier for clean up! Yes! One pot meals are my favorite and Mexican flavors are my favorite favorite. Definitely giving this a try! I love using Barilla Pronto on busy days when I know I am pressed for time when it comes to preparing dinner! We definitely share the same favorites, because I am all about one pan meals and Mexican food, too! This pasta looks so good, Stacey! And since your daughter likes black beans after eating this, that definitely means it's a winner, right? :) Wishing I had this for dinner tonight!